Though mentioned in Domesday Book (11, 4), the status of Binderton church was ambiguous in the Middle Ages. In the C14 there is a record of it as a chapel (VCH 4 p90), but in 1526 and 1536 it is called a parish church, though by custom if not formally it was held in common with West Dean. It consisted of steeple, nave and a chancel ‘severed from it’ (2 pp119-20). It stood in what is now the garden of Binderton House and in 1611 the roof was ‘falling in’ (ibid), though there is no record of this in the surveys of 1602 and 1610 (SRS 98 p18). The church’s location was its downfall, for the owner of Binderton House, Thomas Smith, a Parliamentarian, pulled it down in order to extend his house. After a fairly long gap, in 1671, he caused a new one to be built by the road. The vicar of West Dean, however, refused to consecrate it, as Smith would not augment the living to recompense the extra work (WSRO Par 65/7/6). The vicar furthermore refused to read the burial service for Smith at his death in 1688 (VCH ibid). Someone else did, for he was buried here with a monument; it was only moved to West Dean church in 1839. By then the church was used as a barn, though the parish was only united formally with West Dean in 1933 and as late as 1946 it was recorded as a separate tithe district with its own ascertainment (TNA IR 104/67). The roofless ruin of Smith’s church stands by the road. 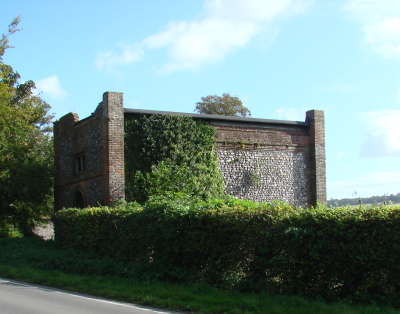 During conservation work in 1984 (vidi), examination confirmed that there was a plain flint and brick rectangular building, lined with clunch, which differed little from dissenting chapels of the period. The windows retain some of their original timber frames and in the east wall are two rectangular recesses like aumbries. Underneath the floor is a burial vault, probably Smith’s. The chapel is now difficult to access, with a boarded up entrance. 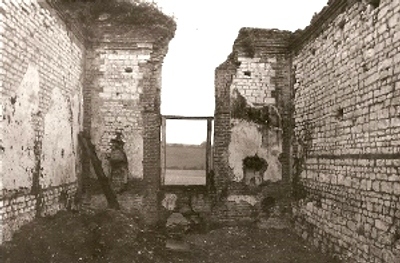 The black and white photograph of the interior dates from 1984, immediately after the conservation work of that year.